This is a newly formed event combining the annual Christmas tree lighting and the Dickens Festival into one grand holiday event. 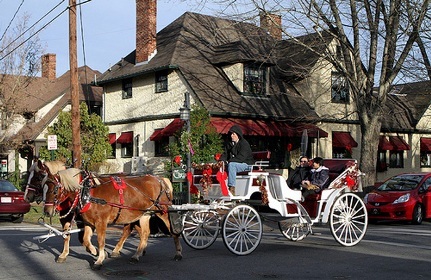 Biltmore Village invites you to step back in time and enjoy Christmas as it once was. Dec 5, Friday 6pm : Over 1000 luminaries will line the streets of Historic Biltmore Village to celebrate the lighting of our 25′ Christmas Tree. The event will feature the AC Reynolds Madrigal Choir. There will be freshly made Christmas Wreaths for sale, in addition to horse drawn carriage rides through the Village and other festive treats. Dec 6, Saturday 1-7pm: Located throughout the Village will be strolling carolers dressed in period costumes, musicians, and other lively holiday entertainment. The Montford Park players will also be on hand to entertain. There will be freshly roasted chestnuts for sale and the horse drawn carriage will be there during the day to complete the holiday experience. Some stores will observe extended holiday hours and will be serving festive treats throughout the weekend. An “Old Fashioned Dickens of a Christmas Festival” is sponsored by Catawba Brewing Company, Olde World Christmas Shoppe, and Budweiser of Asheville, in addition to the merchant members of Historic Biltmore Village Partnership.